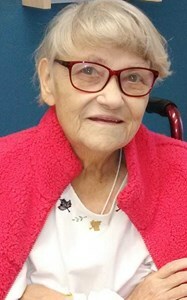 Arlene Louise (Palmer) Harris, 85, of North Syracuse went to be with her Lord and Savior Jesus Christ on February 6th, 2019. She passed to heaven unexpectedly at Upstate Hospital. Born in Fulton, New York, her happy childhood memories were the inspiration behind much of her daughter Susan’s writing, including a series of widely read “Growing Up American” articles. She grew up on Sharp’s pond, formerly a well-known swimming and skating recreational area in Fulton. Her parents Martha and Ira Palmer passed away in the 1970’s. In the early 1950’s, she and her husband built a house on Whitaker Road where they raised their children and resided for thirty years. Arlene was an avid gardener, landscaper and had a keen eye for interior design. She wrote poetry. She was interested in history, holistic medicine, current events and politics until the day she died. She was a devout Christian who prayed daily for her beloved family. She is predeceased by her husband of 62 years, Benjamin Harris; brothers Maurice and Richard; and sisters, Thelma and Kathleen. She is also predeceased by her best friend and companion, her cocker spaniel Katey. She is survived by her children, Scott (Linda) Harris of Fredonia New York, Sharon Harris of Clay, and Susan D. Harris of North Syracuse. She is also survived by her brother Leon Palmer of Fulton, and her grandchildren Melissa Harris, and Sarah and Steven Skiff. Services will be Tuesday, February 12th at the New Comer Cremations & Funerals, 705 N. Main St, North Syracuse, NY 13212. Calling hours are from 5 – 7 p.m. Interment will be at the family plot in Jacksonville Cemetery, Lysander, NY. To share a memory of Arlene, or to leave a special message for the family please click the share memories button above. Add your memories to the guest book of Arlene Harris. Susan, my sincere condolences on the loss of your mother. Even though we are confident in eternal life with God, we still mourn our own loss, the gap that will now be in our lives. As we say in Hawaii, “aloha,” meaning goodbye in this context, but with blessings and affection. Pat and I have a lot of fond memories of our visits to Aunt Arlene's and Uncle Bennys. Many stories from her past kept us interested and wanting to hear more. Then there was the West End Diner. Always good eats. Her laughter was her trade mark . So jolly and jovial.